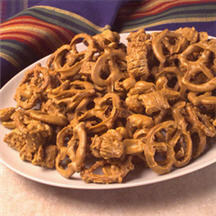 Combine cereal, pretzels, peanuts and caramels in large bowl. Place morsels in medium, microwave-safe bowl. Microwave on MEDIUM-HIGH (70%) power for 1 minute; stir. Microwave at additional 10 to 20-second intervals, stirring until smooth. Pour over cereal mixture; stir to coat evenly. Spread mixture into prepared baking pan; let stand for 20 to 30 minutes or until firm. Break into small pieces.